I haven't met a person yet who doesn't like poppers. They're so tasty with all that cream cheesy goodness mixed with the hint of spice. 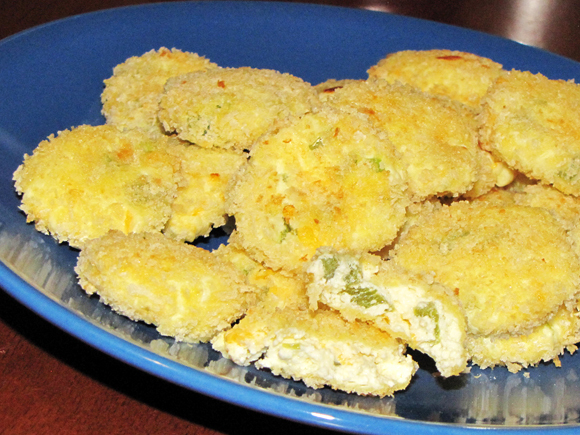 I took that idea and formed it into small bites that are perfect for those get togethers when finger foods are a must. These can also be suited for your tastes by adding more jalapeño or less depending on the spice levels you like. 2. Mix first four ingredients together in bowl. 3. Roll into 1/2" balls. 4. Roll each ball into flour to coat. 5. Next, roll each into the egg and finally the breadcrumbs. 6. Place onto foil-lined baking sheet and flatten slightly into thick coins. 7. Bake for 12-14 minutes turning each coin over halfway through cooking time.